Air Source Heat Pumps (ASHPs) can have an important role in achieving Government CO2 emissions targets. Potential noise created by these systems has often been highlighted as a restricting factor at planning however there is little data available on their actual noise level when installed on site. Instead, designers, planners and customers have had to rely on manufacturers’ data, which are typically based on lab performances. 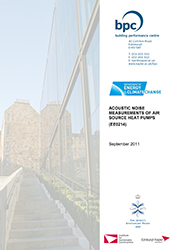 DECC has commissioned RMP, through our research division based at Edinburgh Napier University’s, Building Performance Centre (BPC), to undertake a series of acoustic measurements of in-situ ASHPs. 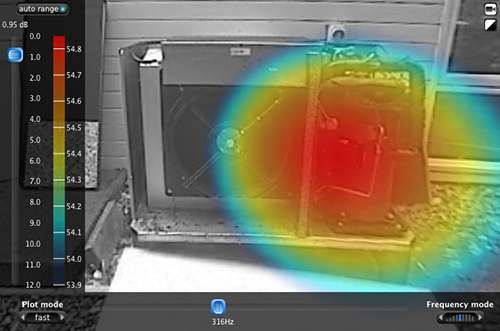 The aim was to measure the sound pressure level at 1m from the heat pump, and to undertake a tonal noise analysis. If tonal noise was found to be present, this information would be fed back to manufacturers to enable them to pinpoint the source of the tone(s) and perhaps enable mitigation. The study involved measurements at 9 sites across the UK all of which are participating in the energy performance trials being undertaken by the Energy Saving Trust. The report found that site installations of the ASHPs are generally in line with predictions derived from manufacturers sound power data. However a number of the ASHPs surveyed were identified as having significant acoustic tones which can adversely affect their subjective acceptability. No correlation between an ASHP’s noise output and ambient temperature or power consumption was identified nor did they appear to give rise to significant levels of vibration in surrounding structures due to the practice of using resilient mounts. The ASHP which used a centrifugal fan appeared to be a noisier arrangement than with an axial fan. No amplitude modulation effects were identified. Manufacturers should be encouraged to present a uniformed set of noise data for their ASHPs in a similar manner to the Micro Wind Turbine Noise Labels. Changes to the design of the ASHPs could reduce their acoustic signature.